March 3rd in Premium Themes by Wordpress Jedi . There is nothing you can’t do with WordPress these days. It’s one of the most powerful and popular content management systems on the market. That’s the main reason while small businesses and bloggers are continuing to adopt the platform. WordPress not only makes creating a blog easy, it also can be used to create job boards, classified websites, e-commerce stores, clones sites, and even forums. You heard it right. You can use your WordPress install to start your very own forum without relying on other scripts such as vBulletin or PHPBB. gForums is a pretty unique WordPress theme that turns your blog into a fully-fledged forum. And you won’t need to rely on other software packages to get up and runing with gForums. Whether you want to add a forum to your existing blog or just start a new forum on a brand new domain, gForums has you covered. It sits on the top of your WordPress install and give you the tool to manage your users and let your visitors engage in discussions on your website. The theme comes with member pages, image slide-show, and report buttons to let you manage your board more effectively. The theme is also pretty light-weight, so it doesn’t put too much pressure on your web server. As you gain members, you may have to increase your resources, but it all depends on how popular your forum gets. Security is always going to be an issue with forum software, but since you are using WordPress to power up your forum, you have plenty of security plugins that you can take advantage of to protect your forum. The theme is pretty affordable and comes with the PSD files you need to customize the look and feel of your forum. The theme is capable of handling media files such as YouTube videos. Your visitors can help you manage your forum by reporting those who engage in inappropriate discussions. 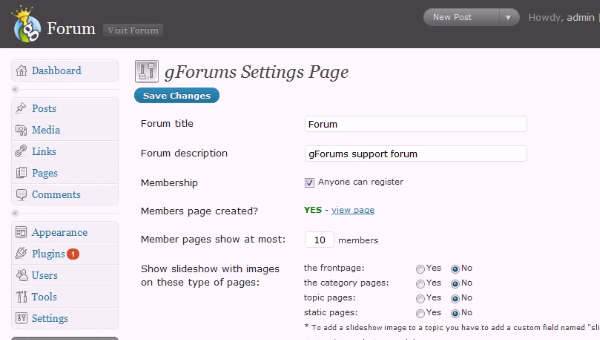 In gForums, you have a clean, powerful theme that turns your WordPress blog into a forum. Can’t get easier than that.